Pretty and feminine, flower hair clips can be fun or subtle. Some hair clips feature bright, bold colors that stand out, while others are decorated with natural-looking flowers for a more subdued look. 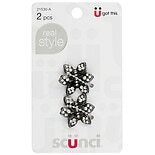 Flower hair clips from Conair, scunci and Gimme Clips offer an eye-catching hair accessory to help you set your style. Flower hair clips can be worn for almost any occasion. Subtle hair clips can be more professional-looking, while colorful flower hair accessories work for any informal event or everyday wear. Rhinestone flower hair clips can look dressy or fun depending on the rest of your ensemble and your hairstyle. In addition to floral hair accessories, there are butterfly hair clips, prints, and neutral or bold-colored hair accessories to choose from here at Walgreens.com. Find plastic or metal barrettes in an assortment of colors and styles for adults and little girls. Ponytailers, headbands and wraps can keep hair away from your face. Jaw clips in small, mini and large sizes work whether you're clipping bangs to one side or trying to contain your curls.